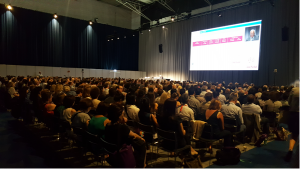 The ESC Congress 2017 was a huge success for the TRI this year and provided an excellent platform from which to present the latest data from the GARFIELD-AF registry and discuss their impact. The congress was off to a great start for us, with a Satellite Symposium on Saturday 26th August, entitled Atrial Fibrillation – a bystander or cause of morbidity and mortality: insights from the GARFIELD-AF registry. 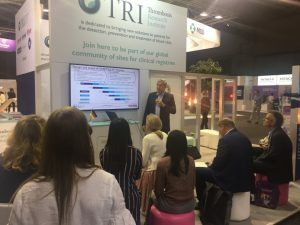 In a room packed with nearly 750 people, international experts from the TRI Steering Committee presented the latest global results, including 1-year outcomes from over 52,000 prospective patients, with a focus on how comorbidities impact the prognosis of patients with atrial fibrillation (AF) and the importance of comprehensive management. In addition to those present, for the first time the TRI streamed the symposium live on our Twitter channel via Periscope, allowing another 159 viewers to join the session. Since then, a further 29 people have tuned in to watch the event, and if you missed it, it’s still possible to view via @GARFIELD_reg here. Additionally we have posted it on the GARFIELD-AF website here. We provided attendees at the booth with an opportunity to hear first-hand from our National Coordinating Investigators (NCIs) from Chile, Germany, Japan, Spain, and the UK, who kindly gave of their time to present country-specific data and respond to questions. You will be able to watch the different country data showcases, including an interview with each NCI, on this website soon, so please look out for these in the coming weeks. Key GARFIELD-AF data, including the first insights from the registry on health economics in AF, were also presented during seven poster presentations, one of which was denoted as an ESC Best Poster and detailed the impact of congestive heart failure (CHF) on 1-year clinical outcomes in newly diagnosed AF. All of the posters can be found and downloaded on this website here. Professor Ramon Corbalan presented the Best Poster on the Monday of the congress and reported that the one-third of patients with CHF who had ischaemic cardiomyopathy had worse outcomes compared to those with non-ischaemic cardiomyopathy. In addition, they were less frequently anticoagulated, more often received antiplatelet therapy, and were prescribed fewer CHF medications than patients with non-ischaemic cardiomyopathy. Meanwhile, Professor Lorenzo Mantovani presented a poster that unveiled the first-ever real-world health economics data from GARFIELD-AF, which showed that AF imposes a high financial, economic and human burden on societies across Europe and that there is significant geographical variation in the amount and type of health services used by patients across the world. Data were presented on patients with AF enrolled in France, Germany, Italy, Spain and the UK during 2010–2015. These patients generated a total of 8,574 person-years of observation and large variations among the five countries were seen, with higher costs per patient per year in the UK (£2,857.3) and Germany (€2,504.1) than in the other countries. We’d like to thank all those who participated in our activities at ESC and we hope to see you again next year!